Adaptec Series 6E Unified Serial Sata/Sas Raid Controller Delivers The Robustness Of Hardware Raid And The Adaptec Raid Code, Enterprise Class Management Features, And Full Os Support. Delivering The Same 6 Gb/S Performance Of The Series 6 Controller, The Series 6E Is Optimized For Platform Where A Series 6 Controller Would Not Fit In From A Price, Form Factor Or Host Connectivity Standpoint. 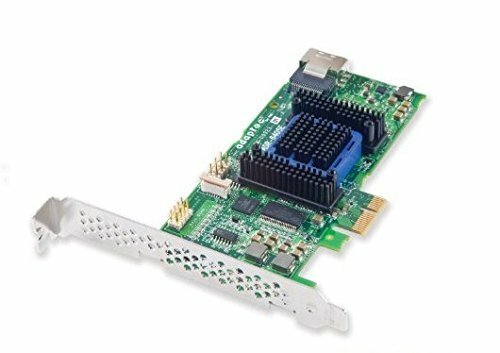 Series 6E Controller Supports Sata And Sas Devices, And Has Been Qualified With The Same Systems, Motherboards, Backplanes And Drives As Series 6 Controller. It Includes The Same Drivers, Bios And Storage Management Tools As Series 6 Controller And Do Not Require Additional Training Or Qualification. Series 6E Controller Has Also Been Thoroughly Tested With Entry-Level Storage Devices For Desktop Use And The Entry-Level Server Platforms, Workstations And Motherboards Most Typically Used For Basic Servers, Performance Workstations Or Industrial Pcs.